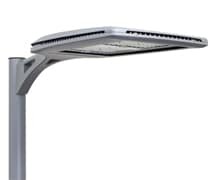 San Marcos, TX – The latest addition to the Philips portfolio of LED luminaires underscores the inherent flexibility of advanced LED design, and the latest in integrated technologies, such as built-in lighting controls and optics that meet exacting LEED light trespass requirements. 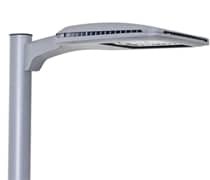 In addition, PureForm from Philips Gardco features a modern aesthetic and state-of-the-art thermal management with the benefits of LED to deliver up to 65 percent more energy-efficiency over the pulse-start metal halide systems it was designed to replace. Designed for use in parking lots, PureForm’s high performance optics allow for covering large areas with more uniform light quality and fewer pole locations, as well as offering a 4,000°K color temperature that rivals traditional metal halide systems. Delivering on the promise of LED, PureForm will also last significantly longer than traditional metal halide light sources. The luminaire itself boasts a profile of less than three inches and a maximized lumen output range of 4,500 lumens to more than 25,000 lumens. Application flexibility is achieved via two different housing sizes and five distinct mountings, including three unique pole mount arms, a mast arm mount and wall mount versions. As opposed to traditional systems that are either ‘on’ or ‘off’, PureForm offers intelligent controls such as integrated motion response and auto profile dimming. This allows for added energy savings by reducing the luminaire’s power consumption during off-peak hours. Adding to PureForm cost savings is its ease of maintenance. Accessing the LED drivers is done by loosening two captive screws, which allow the LED driver compartment to be opened. The LED drivers themselves are on a driver tray which can be easily removed and replaced. Optional tool less access allows entry into the driver compartment, and removal of the driver tray without tools. Access to LED arrays themselves is done by removing two hex-head screws for easy service. Electrical connections are made via quick disconnect devices.